Objectives Antibiotic resistance has risen dramatically over the past years. For individual patients, adequate initial antibiotic therapy is essential for clinical outcome. Computer-assisted decision support systems (CDSSs) are advocated to support implementation of rational anti-infective treatment strategies based on guidelines. The aim of this study was to evaluate long-term effects after implementation of a CDSS. Design This prospective ‘before/after’ cohort study was conducted over four observation periods within 5 years. One preinterventional period (pre) was compared with three postinterventional periods: directly after intensive implementation efforts (post1), 2 years (post2) and 3 years (post3) after implementation. Setting Five anaesthesiological-managed intensive care units (ICU) (one cardiosurgical, one neurosurgical, two interdisciplinary and one intermediate care) at a university hospital. Participants Adult patients with an ICU stay of >48 h were included in the analysis. 1316 patients were included in the analysis for a total of 12 965 ICU days. Intervention Implementation of a CDSS. Outcome measures The primary end point was percentage of days with guideline adherence during ICU treatment. Secondary end points were antibiotic-free days and all-cause mortality compared for patients with low versus high guideline adherence. Main results Adherence to guidelines increased from 61% prior to implementation to 92% in post1, decreased in post2 to 76% and remained significantly higher compared with baseline in post3, with 71% (p=0.178). Additionally, antibiotic-free days increased over study periods. At all time periods, mortality for patients with low guideline adherence was higher with 12.3% versus 8% (p=0.014) and an adjusted OR of 1.56 (95% CI 1.05 to 2.31). Conclusions Implementation of computerised regional adapted guidelines for antibiotic therapy is paralleled with improved adherence. Even without further measures, adherence stayed high for a longer period and was paralleled by reduced antibiotic exposure. Improved guideline adherence was associated with reduced ICU mortality. No previous study has examined the possible long-term effect of a computerised decision support system for antibiotics on adherence to locally adapted guidelines developed by a multidisciplinary team. The results suggest that adherence to locally adapted guidelines increased following implementation of a computerised decision support system and remained at a reasonable level. This was paralleled by an increase of antibiotic-free days and lower mortality was observed in patients with high guideline adherence. Data from this study are based mainly on surgical patients in one university hospital; consequently, external validity is restricted mainly to the postoperative setting and we do not know whether our findings are reliable for other facilities. The unblinded nature and non-randomised design are further study limitations. The use of antibiotics in medicine, which has led to the emergence and dissemination of resistant pathogens,1 ,2 has major implications for morbidity and mortality in intensive care units (ICUs).3 Early adequate therapy is crucial for the outcome of critically ill patients.4 ,5 Moreover, it has implications for healthcare costs.6 Despite this, the rate of inappropriate antibiotic usage remains high.7 Barriers to change management have been identified in different healthcare settings. However, although intensive efforts have demonstrated some potential to improve practice, longer-term follow-up has failed to show sustained effects.8 Reasons for delays in initiating adequate therapy include the lack of availability of information and difficulties with prompt prescribing typically due to inefficient communication between staff members. On the other hand, initiating and performing microbiological diagnostics is also challenging, but there is evidence that a less aggressive treatment strategy might be beneficial for patient outcomes as long as expedient microbiology is available.9 For this reason, experts from all over the world have encouraged the development of stewardship programmes as a major goal for the future.10 ,11 Although locally adapted guidelines may help to enhance microbiological diagnostics and initial antibiotic therapy, these are not always readily available. Thus, computerised decision support systems (CDSSs) have been developed and studied over the past several years.12 ,13 In the 1990s, Evans et al13 developed a system for antimicrobial therapy and were able to show a reduction in inpatient costs and length of stay. Buising et al14 were able to show that, as an educational measure, a CDSS was the single most efficient method of improving guideline implementation for the treatment of community-acquired pneumonia compared with education alone. However, there is currently no evidence regarding the long-term efficacy of a CDSS to improve guideline adherence to the treatment of the most relevant infections in a surgical ICU setting. For this study we hypothesised that implementation of a CDSS for antibiotic therapy, specifically one created by a multidisciplinary front-line team, is able to increase and maintain guideline adherence without further efforts. Presumably, this should lead to decreased antibiotic usage and improved clinical outcome. This prospective cohort study was conducted as a clinical prospective prentervention/postintervention study over four evaluation time periods within 5 years totalling 12 965 patient days in the ICU. The preinterventional period (‘pre’) took place from January to April 2006, the first postinterventional period (‘post1’) from February to April 2007, post2 from August to October 2009 and post3 from February to March 2010. During the pre-period, paper-based guidelines for antibiotic therapy were made available to every ward physician. Guidelines incorporated national and international guidelines for diagnostics as well as for therapy and were adjusted to the institutional resistances rates. These paper-based guidelines contained a short definition, diagnostic requirements, the spectrum of causative pathogens and empiric therapy recommendations for every infection. Following this baseline time period, a CDSS for antibiotic therapy was designed as a tool to provide clinicians with essential guideline-based information concerning the treatment of infections, the use of antibiotic agents and microbiological diagnostics in the ICU. The CDSS could be accessed from every computer in the hospital, including all computers used to document electronic patient files. The CDSS contains algorithms and pathways for most infections occurring in patients in surgical ICUs. For every infection included in the CDSS, there is one main five step algorithm. This algorithm leads the user to the first interface to reassess infection signs to evaluate whether diagnosis of an infection is plausible. Next, the user is guided to a page where the suspected infection focus has to be identified. Then, there is a request for differential diagnoses and focus specifications, followed by a fourth page showing diagnostic procedures that are needed for the specific focus. In the fifth step there is a page where suggestions are made for empiric therapy (compare figure 1A). Additionally, the CDSS includes links to references and background information focusing on the infections covered and also points out the tools required, for example, calculators for renal creatinine clearance. Local resistance patterns of bacterial pathogens were included for every study ward (compare figure 1B–C). Each algorithm was developed by a multidisciplinary team of ICU experts from the fields of microbiology, infectious diseases, surgery, pharmacology and specialists for each focus of the algorithms. The team also included front-line providers of patient care and those with less professional experience (residents and medical students). Presentation of different user interfaces in the computerised decision support program (available at http://www.dgai-abx.de/en/). 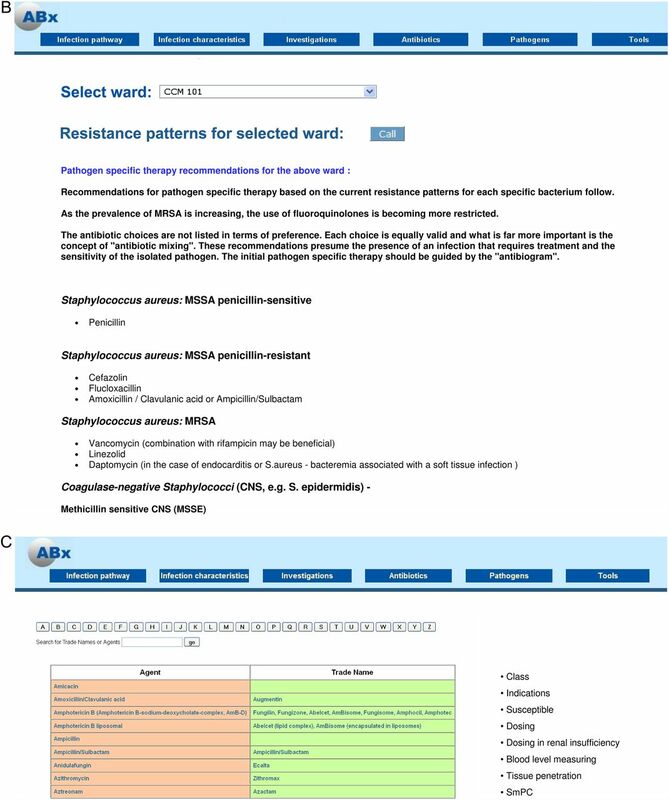 (A) Summary of infection characteristics; (B) selection menu in the module resistance patterns and targeted therapy; (C) selection menu in the antibiotic agents module. 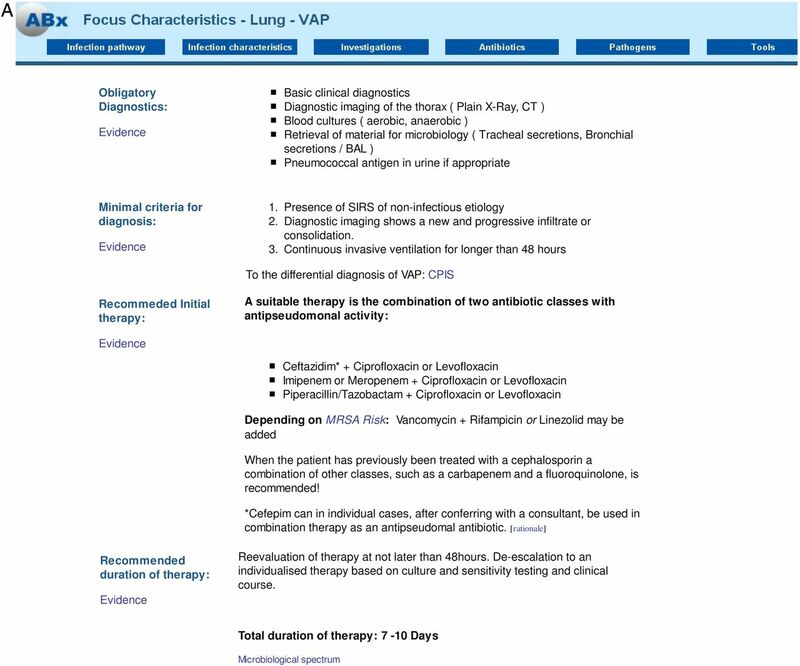 BAL, bronchoalveolar lavage; CPIS, Clinical Pulmonary Infection Score; MRSA, methicillin-resistant Staphylococcus aureus; VAP, ventilator-associated pneumonia. The CDSS also contains a section for bacterial pathogens and their targeted treatment (compare figure 1B). In patients with microbiological pathogen identification the CDSS can be used to guide choice of targeted antibiotic therapy as well. In summary, the programme was initially developed to support empiric antibiotic therapy but also addressed de-escalation strategies and targeted antibiotic therapy when pathogens were identified in microbiological diagnostics. The programme also incorporates educational aspects with tools and evidence from the current medical literature to support recommendations given. After the programme was finished and released, it was introduced in every ICU of the department, giving every staff member the opportunity to be trained in the applications. The programme included a contact link to communicate with the team responsible for drafting the CDSS. Furthermore, one physician provided telephone support. All queries were immediately discussed in the team and, if deemed relevant, incorporated into the decision pathways. One full-time physician was responsible for changing the programme, for example, if new drugs were available or locally updated resistance was available during the course of the study. Data were collected in five predominantly surgical ICU with altogether 61 beds at the Charité University Hospital in Berlin, Germany, a tertiary medical care centre with 3200 beds. In these ICUs there is constant rotation with every physician working for at least 2 years. In the beginning there is structured training that includes the usage of the antibiotic CDSS. There is always a well-trained senior together with a younger doctor. Additionally, there is a consultant either in the ward or reachable via phone, which is especially critical during night shifts. This team provides 24/7 care for patients. During the study period, there was no restriction of diagnostic procedures or choice of antibiotic therapy for participating ICUs. Antibiotic therapy was prescribed by the physicians in charge under approval of the senior consultant. Most patients were admitted to the ICU postoperatively from different surgical disciplines (abdominal surgery, cardiac surgery, neurosurgery, trauma surgery and gynaecology); other patients included non-operative patients suffering from acute respiratory distress syndrome. For this study we included every consecutive patient older than 18 years of age with a length of stay in the ICU >48 h.
Patient data were collected directly into electronic case report files for each treatment day in the ICU. Data on gender, age, medical history including substance abuse, surgical procedures, length of stay and mode of discharge (intensive care, intermediate care, normal care or death), vital signs, laboratory findings, microbiological and radiological diagnostics, and anti-infective therapy were obtained. To ensure data consistency, study data were re-evaluated in the middle and at the end of each collection period. ICU scores (SOFA and SAPS II), which are assessed regularly in the participating ICUs, were also documented. Additionally, infection status and the supposed or known focus of infection were documented daily. Immunosuppression was defined as receiving immunosuppressive medications such as corticosteroids above the Cushing level, immune suppressive agents, monoclonal antibodies or chemotherapy within the past 6 weeks. Microbiological findings were grouped by fungal pathogens, Gram-positive and Gram-negative pathogens and pathogens with enhanced resistance patterns. The latter included intrinsic resistances as well as acquired resistances, which are known to be more difficult to treat. At the end of each evaluation period a team of infectious disease and critical care specialists assessed the antibiotic therapy in terms of guideline adherence. To justify infection management, diagnostic investigations and antibiotic therapy of suspected or known infection were compared with guideline recommendations.15 An ICU day was defined as discrepant from guidelines if one or more of the following criteria were identified: (A) disregarding drug history (eg, starting an antibiotic therapy for a new infection using the same agent that has recently been given to this patient); (B) insufficient diagnostic measurements (eg, no microbiological samples before start of antibiotic therapy, or no X-ray before starting a treatment of suspected pneumonia); (C) delayed antibiotic therapy (eg, documentation of infection with accidental delay of empirical antibiotic therapy); (D) unsuitable combination therapy (eg, combination of two β-lactam antipseudomonal antibiotics); (E) omission of combination drug (eg, inappropriate coverage in patients with increased methicillin-resistant Staphylococcus aureus risks); (F) antibiotic therapy in patients without signs of infection (eg, prolonging antibiotic prophylaxis or treating SIRS with no signs of infection) or (G) continuing empirical broad spectrum coverage without antibiotic de-escalation in patients with documented pathogen detection causative for infection. If the physician who cared for the patients on the ICUs had documented a justification for non adherence, the day was counted as adherent. After the initial evaluation, data were audited by experts independent from the study team. The expert team was unblinded to the patients and the data collecting part of the study but blinded to the evaluation of the adherence rating of the study team. The members of the expert team had open access to every patient's data file and were able to randomly scrutinise the data and evaluate the adherence independently from the study team. The decision of the expert team was determining. None of the persons evaluating adherence were involved in decision-making on the ward at any time for any patient. The primary end point is guideline adherence over 5 years. Since resistances change over time, guidelines could be modified during each evaluation period if new microbiological findings became available. All statistical analyses were performed with PASW V.19 (SPSS Inc, USA). Categorical data are displayed as absolute and relative values. Fisher's exact and χ2 tests were applied for statistical hypothesis testing of categorical variables. Continuous data are displayed as means and consecutive SD or median and quartiles depending on their distribution. The Kruskal-Wallis tests and analyses of variance were performed for continuous data accordingly. The significance level was defined as a two-sided p<0.05 for all tests. Variables were additionally evaluated using multivariate logistic regression analyses. For this, we first examined those factors that were clinically important in univariate analysis focusing on long-term effect of the intervention (study groups pre vs post3). In the consecutive regression model, all parameters were entered that showed a significant difference in the univariate analyses resulting in seven factors (surgical patient, pre-existing pulmonary disease, chronic liver disease and kidney failure, diabetes mellitus, psychiatric disease and guideline adherence). In a second regression analysis on ICU mortality, we also used this approach and evaluated baseline characteristics in regard to the interesting factor of high versus low guideline adherence; the consecutive regression analysis had to include eight factors (age, immune suppression, infection of bones or joints, soft tissue infection, unknown focus of infection, fungal infection, detection of multidrug resistant pathogens and guideline adherence). The institutional review board waived the need for informed consent owing to the observational character of the study. A total of 1395 patients were treated during the study period. After exclusion of patients with treatment in ICU of less than 48 h, 1316 patients were included in present analysis. Basic characteristics are shown in table 1. Patients included during the four evaluation periods were comparable; however, differences were seen in the distribution of age, gender and pre-existing conditions. An increase of concomitant pulmonary disease and chronic kidney failure over time was noted. Pneumonia and abdominal or surgical site infections accounted for most ICU infections observed. Adherence to guidelines was 61.4±37% in the pre period. Guideline adherence increased significantly to 92±19% in post1 (pre/post1 p<0.001). It then decreased to 76.3±30.7% (post1/post2 p<0.001) and remained constant at 71.1±34.0% in post3 (post2/post3 p=0.178, pre/post 3 p=0.001). Thus, a net increase of 10% guideline adherence was observed during the 5-year observation period. 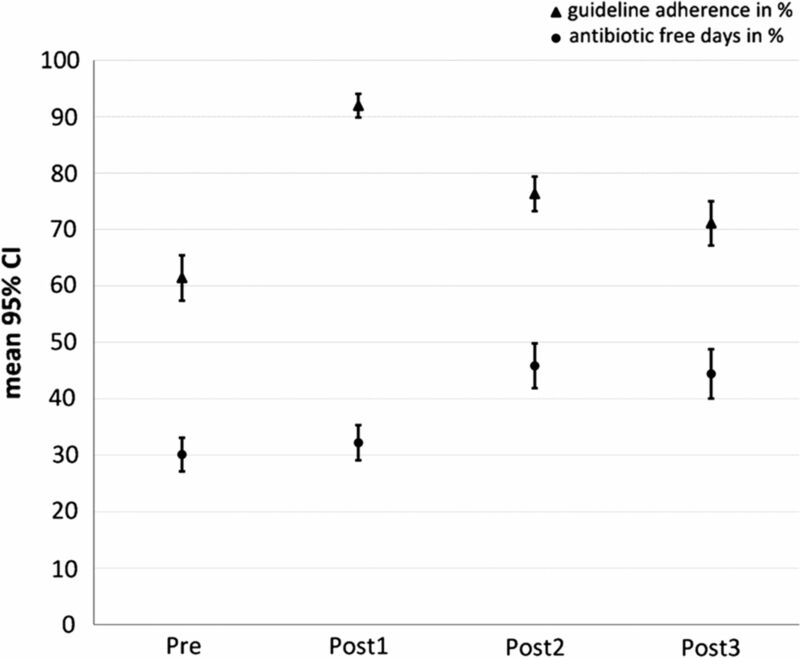 Figure 2 shows the guidelines adherence in connection with the antibiotic free days. Adherence to guideline and percentage of antibiotic free days over study periods. MSSA, methicillin-susceptible Staphylococcus aureus; MRSA, methicillin-resistant Staphylococcus aureus; S. epidermidis Staphylococcus epidermidis. The validation of the primary endpoint, guideline adherence, between pre and post3 is shown in table 2. The following variables were included in a logistic regression analysis as independent variables based on baseline characteristics: surgical patient, pre-existing pulmonary disease, chronic liver disease and kidney failure, diabetes mellitus, psychiatric disease and guideline adherence. After including these variables, the positive association between guideline adherence and time period (pre vs post3) remained statistically significant with an adjusted OR of 1.905 (1.359 to 2.669; p<0.001). Measures of clinical performance and differences in antibiotic therapy are shown in table 3. Notably, antibiotic-free days (AFD) increased over time starting from 30% of all ICU days (pre) to 32% (post1), 46% (post2) and finally achieving 42% (post3), with a corresponding p<0.01 over all time periods. Mortality during each evaluation period was lower for patients with guideline adherence above 70%. Of 471 patients with an adherence less than 70%, 58 died (12.3%) compared with 68 of 845 with an adherence greater than 70% (8%; p=0.014). Based on this model, guideline adherence remained statistically significant associated with ICU mortality with an adjusted OR of 1.556 (95% CI 1.05 to 2.31; table 4). Adherence to locally adapted guidelines increased following implementation of a CDSS. Meaningful improvement in adherence was observed at 5 years without any further measures or interventions. Antibiotic-free days increased accordingly and lower mortality was found in patients with guidelines adherence above 70%. Although some of the sample characteristics varied throughout the evaluation periods during this study, these variations were not unexpected, based on previous studies.19 For instance, the prevalence of pre-existing conditions changed over the 5-year course of this study with increased rates of concomitant pulmonary diseases and chronic kidney failure over time. This is consistent with other reports that the number of chronically ill patients increases over time.20 Distribution of infections showed significant variation between the four evaluation periods. Since infections are dependent on different factors, this may be due to seasonal changes or a random spread. After adjusting for potential confounders in a multivariable regression model including relevant factors, guideline adherence was higher in the postintervention periods independent of other pre-existing conditions. Guidelines adherence is a process parameter and does not provide a sufficient measure of the quality of care on its own. Dangers associated with the overuse of antibiotics are well recognised,12 and one objective of antimicrobial stewardship programmes is to reduce unnecessary use of antibiotics.7 In our data set, the number of AFD increased over time. Thus, our data suggest that an individual patient receives shorter courses of antibiotics as guideline adherence increases. This is in line with previous findings that a CDSS can decrease antibiotic usage.26 The use of antibiotics in the post1 period did not fall as much as anticipated in light of the high percentage of adherence. It appears that more time was needed to change the minds of doctors in the ward, as evidenced by the continued increase in ADF over the 5-year observation period. This hypothesis is supported by Samore et al27 in a study of a CDSS on the ambulant prescribing of antibiotics. They found a significant reduction in overall antibiotic use and improved appropriateness of antibiotic selection was observed after CDSS implementation. This group also described that although the rate of prescription did not change much in the first year following the introduction of a CDSS, adequacy did improved. In the second year, they found a decrease in the prescription rate, which translated into a decrease in unnecessary use.27 Unfortunately, this study lacked long-term follow-up; thus, no conclusions may be drawn about the sustained effects of those measures. Evans et al13 were able to show that after the introduction of a CDSS, patients received fewer antibiotics and had a shorter duration of antibiotic therapy. However, this study also only had a 2-year observation period. We believe that a randomised controlled trial would not be a feasible design, since following guidelines is crucial for the outcome and it would be unethical to restrain adequate therapy from control group patients. In concordance to the conclusions of Sintchenko et al,29 a preinterventional and postinterventional design is the best available for this research question. On the other hand, this design is limited in inferring on causalities, as other factors might have influenced the results. In this context, we aimed to carefully assess for potential confounders but we could only control for a defined set of observed variables. For this study, external validity is restricted mainly to the postoperative setting. Also, our recommendations are locally adapted and results of this single centre study in a tertiary university hospital might not be transferable to other settings with its specific decision-making structure. Another potential limitation is related to the unblinded nature of this study. To control at least partially for this effect, a team consisting of a senior consultant and two assistants evaluated the data for adherence. To further control for bias, an expert team randomly scrutinised the data for the results of the study team that was blinded, and had the final decision. Although there is some evidence in the literature that a cut-off for adherence of 70% might be a first pragmatic barrier in change management17 ,18 associated with improved patient outcome,16 ,30 in the long run adherence rates of >95% should be targeted to optimise quality of treatment. To the best of our knowledge, this is the first study to show improved long-term guideline adherence following the implementation of a CDSS. Adherence rate at 5 years remained above a level of 70%. Consequently, we are able to show that CDSS seems to have a lasting benefit, although physicians were only trained in the beginning of the study. Improvement in guideline adherence was paralleled by reductions in individual antibiotic therapy. Furthermore, overall ICU mortality was associated with guideline adherence further supporting the role of CDSS in improving the quality of care. Success of this implementation is probably due to the multidisciplinary front-line team that developed the CDSS, which included all disciplines involved in the decision-making process in the ICU. One key advantage of this programme is that, with help of a special function, it can easily be customised to meet the needs of any intensive care facility and that it is available to any ward with internet access. As one of the key components to improving prescription patterns, CDSS may help to develop sufficient stewardship programmes in the future.
. Interventions to improve antibiotic prescribing practices for hospital inpatients. Cochrane Database Syst Rev 2013;4:CD003543. IN and ST contributed equally. Contributors All authors have made substantial intellectual contributions to the manuscript; all authors read and approved the final manuscript. IN worked out the conception and design of the study, substantially developed algorithms of the CDSS, implemented the CDSS in daily routine, substantially updated content of the CDSS and was responsible for data acquisition, analyses and interpretation, revised the primary study data and drafted the final manuscript. ST worked out the conception and design of the study, substantially developed algorithms of the CDSS, implemented the CDSS in daily routine, substantially updated content of the CDSS and analysed the primary study data, performed statistical analyses, prepared the presentation and drafted the final manuscript. MD substantially developed algorithms of the CDSS, implemented the CDSS in daily routine, substantially updated content of the CDSS and revised the final manuscript. EH and EM substantially developed algorithms of the CDSS, substantially updated content of the CDSS, worked out conception and design of the study and revised the final version of the manuscript. MCG supervised primary data collection, revised all presented data, prepared the presentation and re-evaluated the manuscript. AT and AR were responsible for data acquisition, revised and analysed the primary study data and updates of the CDSS, performed statistical analyses and prepared the presentation. AU substantially developed algorithms of the CDSS, substantially updated content of the CDSS, worked out conception and design of the study and revised the final version of the manuscript. LMB revised all presented data, prepared the presentation and re-evaluated the manuscript. KDW worked out the conception and design of the study, was responsible for analyses and interpretation of the data, performed statistical analyses and reevaluated the manuscript. CS worked out the conception and design of the study, substantially developed algorithms of the CDSS, substantially updated content of the CDSS and was responsible for analyses and interpretation of the data, revised the manuscript and gave approval to the final version to be published. Funding The study was supported in part by a grant (DFG SP 432/7-1) from the German Research Society, grants by the BDA/DGAI and inner university grants. Competing interests IN and ST have received lecture fees from Roche and Pfizer that are unrelated to this study. MD received lecture fees and grants from BD, MSD, Pfizer, Gilead and Astellas, and received funding from Forest unrelated to this study. AT received travel support and honoraria unrelated to this study from SIRS Lab GmBH and Orion Pharma. CS or the institution received funding unrelated to this study from Abbott, Aspect, Agus, Baxter, Braun, Care Fusion, Deltex, Essex Pharma, Fresenius Kabi, GSK, Grünenthal, Hutchinson, KöhlerChemie, MSD, MCN, Novartis, Pajunk, Pulsion, Roche and Sysmex, and received grants for other projects from German national anesthesiological societies (BDA, DGAI), BMBF, DKH, DLR, GIZ, University Stavanger and Bisperjerk hospital. Ethics approval This observational study was approved by the institutional review board of Charité University Hospital in Berlin and the hospital data safety authorities. Data sharing statement Data for this study were extracted from a clinical data base exclusively for this article. These data are available from the corresponding authors (University Professor, Dr, Claudia Spies, claudia.spies@charite.de) of this article on request (statistical code, data set).